Time for another roundup of audiobook reviews from around the blogosphere! If you're looking for audiobook reviews and recommendations, don't forget to visit Audiobook Jukebox. If I missed your July review or post about audiobooks, leave me a link in comments and I'll add it. And if you didn't post about audiobooks this month, there's always next month when Kelly at STACKED will be hosting another roundup. 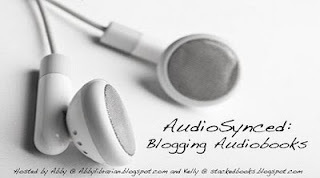 Teri at The Goddess of YA Literature posts about chairing the Odyssey Committee and shares some great resources for choosing and evaluating audiobooks. Call it Courage by Armstrong Sperry, read by George Guidall, reviewed by Allison at Reading Everywhere. Allison says, "The audiobook makes for a pleasant way to approach this book." The Flint Heart by Katherine Paterson and John Paterson, read by Ralph Lister, reviewed by Lisa at Shelf-employed. Lisa says, "This chapter book will make a great family read or listen-aloud..."
Masters of Disaster by Gary Paulsen, read by Nick Podehl, reviewed by Sarah at GreenBean TeenQueen. Sarah says, "I'm glad I decided to listen, because while I'm sure it's a fun read, it's hilarious as an audiobook!" Time for Stars by Robert Heinlein, read by Barrett Whitener, reviewed by Flannery at The Readventurer. Flannery says, "I enjoyed [Whitener's] narration for the most part." Check out flash reviews of Jellicoe Road by Melina Marchetta and The Scorpio Races by Maggie Stiefvater at GreenBean TeenQueen. Daughter of Smoke and Bone by Laini Taylor, read by Khristine Hvam, reviewed by Brenda at proseandkahn. Brenda says, "She matches the novel's initial leisurely pace and utilizes rich accents and a variety of voices for most of the characters." Enchanted by Alethea Kontis, read by Katherine Kellgren, reviewed by Misti at Kid Lit Geek. Misti says, "I was completely . . . enchanted." The Isle of Blood by Rick Yancey, read by Steven Boyer, reviewed by Brenda at proseandkahn. Brenda says, "As usual, Stephen Boyer's performance is nothing short of amazing." Little Women (Part 2) by Louisa May Alcott, reviewed by Kate Reading, reviewed by Lee at Reading with my ears. Lee says, "Reading reads the prolix 19th century prose with confidence, and creates distinct characters for the four sisters as well as many others in the novel..."
Red Glove by Holly Black, read by Jesse Eisenberg, reviewed by Lee at Reading with my ears. Lee says, "Eisenberg doesn't voice the novel, but he doesn't need to. His command of Cassel's character is enough to keep this audiobook interesting." Redshirts by John Scalzi, read by Wil Wheaton, reviewed by Sarah at GreenBean TeenQueen. Sarah says, "Wheaton gets the humor of the book and adds a nice spin on the characters (especially the captain's more crazy moments). But he doesn't do a wide range of voices like I'm used to from my audiobooks." This Time Together: Laughter and Reflection, written and read by Carol Burnett, reviewed by Flannery at The Readventurer. Flannery says, "This book, specifically this audiobook, is for the people who love hearing people tell stories..."